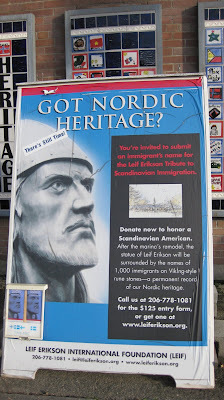 Nearby Norwegians: Got Nordic Heritage? We are Luci Baker Johnson, Chery Kinnick, Cathy Lykes, Carolyn Merritt and Barbara Holz Sullivan, members of a small writing/research group with a big interest in Norwegian-American culture and many plans for the future. We met each other while attending the Nearby History writer's seminar hosted by the Museum of History and Industry, and the Genealogy and Family History Certificate Program at the University of Washington. We each have a dedication to research and writing, and so, we formed a small, intimate group to continue collaborating and working toward individual and collective goals beyond the scope of the above programs. We are fortunate enough to live in or near Seattle, Washington, USA, where many libraries and research facilities are available, including a wealth of Norwegian cultural resources in and around the old Scandinavian community of Ballard. Let us share with you as we begin a journey toward creative self-fulfillment in research, writing, and publishing, and embark on a mission to aid and educate, and in particular, to help preserve, promote, and celebrate the unique family heritage and genealogical histories of Norwegian-Americans. "Got Nordic Heritage?" Message Board Outside the Nordic Heritage Museum, Seattle. Photograph. November 2008. Privately held by Chery Kinnick, [ADDRESS FOR PRIVATE USE,] Snoqualmie Pass, Washington. 2008.